I've started using Idea 12 CE, and have found the overall experience quite good. The only thing that I have rubbed against is that sometimes (when typing quickly), the UI will lag while it performs lookups for autocompletion (or background compiling, or something...). 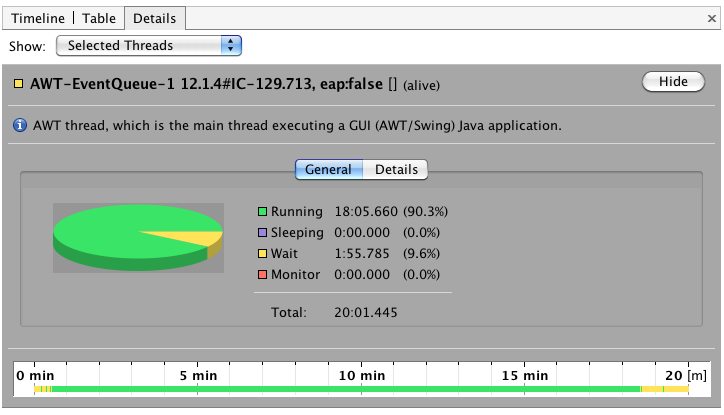 By my estimation, I have noticed this delay reach up to 500ms, but it is usually <250ms. It's worth noting that this is on a quad core 3ghz Xeon workstation, with loads of RAM & HD space, and no other applications exhibit such behaviour (which is to say, it's not my machine, which is an OS X machine). Nonetheless, if the intermittant lag had stayed so low (100-500ms), then I probably would have just dealt with it... never composing this forum post, as it is not sufficiently annoying (nor time-consuming) to warrant discarding the whole tool along with its most excellent features. As an experiment, I thought that I might use Idea's multi-column editing & autocompletion to accelerate the conversion... or... attempted conversion of a C source file to JAVA, and for the first step, I created a new java class and pasted the source code into the new file. The UI instantly locked up for many minutes (not an exageration). I gave it some time, and had thought that it had truly frozen (never to recover), but when I came back to that virtual screen later (maybe 30 minutes later). IDEA had recovered, and was doing fine. I thought this was odd, but since I was happy to continue with the experiment, I started editing the file. As far as I can tell, at the very first opportunity that IDEA was trying to present a popup menu of autocompletion choices, the UI locked up again (this time about 5 minutes). This seems really odd to me, but also like a great opportunity to help IntelliJ to become faster & more responsive. Consequently, easier to use. Now, I would presume that there would be no purposeful compiling/process-waiting/blocking or other heavy-lifting in the UI thread... as IMO, there is no reason that the UI thread should have to block and wait for anything, as it's purpose is to interface with *me* :) However, when performing a thread dump of IDEA when it is in this state, it looks like it *IS* deep in some java parsing (or something). I would be greatly interested to know if anyone else can reproduce this issue (is it VM-specific? ), and if there is interest in fixing it from someone who is already more knowledgable of IDEA's innards. I would presume that this is the same lag that I usually see (only in a more sever form). In retrospect, I realize that the condition cleared (again) while I was typing the forum post... the timeline area of interest is actually the *GREEN* area (!!!). Could you make a cpu snapshot for the problem situation and provide it for further analysis?